Two national polls were released this week: EKOS and Abacus. The results were strikingly consistent with other December and January polls in all regions, so there's basically nothing to be said. 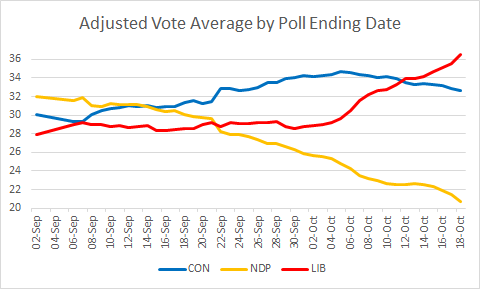 It seems that Canadians are basically in a wait-and-see mode - specifically, wait for an election, see what different parties are offering, and only then change their allegiance if necessary. The average Tory-Grit gap is unchanged at 7.7%. 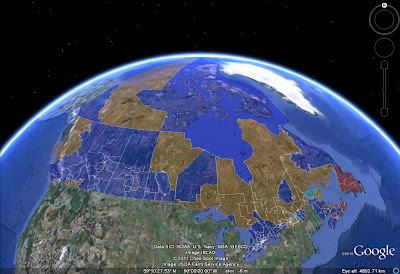 Note to Readers, April 23, 2011: Please go to the front page of the blog for the most recent updates. This post is 3 months old, and there have been 83 posts since! My life has been quite hectic since the New Year, and it will remain this way for the rest of the month. 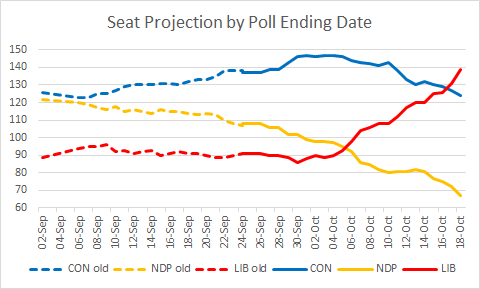 Nevertheless, I found some time at the airport today to update my projection based on the most recent Angus Reid, EKOS, Harris-Decima and Léger polls. However, the national popular vote has been essentially frozen in place: the Tories' weighted average lead is 7.7%.